the kids were home from school, things were winding down for the day - when suddenly, a gunshot rang out! Then another! Screams were heard, then sirens. It was murder; a double homicide. Right here in Bayside Flats! But wait! That's not all! This morning brought two more mysterious deaths! What is happening? Who is the killer? When will it end? and enjoy the serenity! Follow his notes in the "Case File" reports found at the end of each character's bio. However, if you don't have Pets or a later EP/SP installed, you can temporarily remove Bluewater Village (B001) from the NeighborhoodTemplate folder and move this subhood in there. It will still be referred as Bluewater Village in the game. 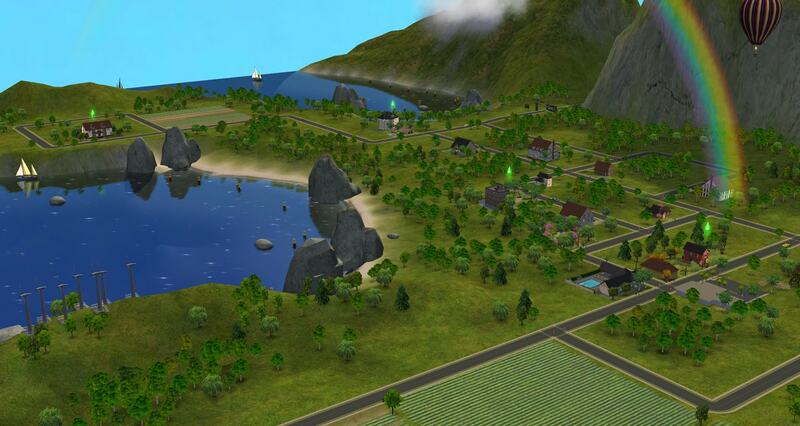 But the game will add Bayside Flats to your neighborhood. Restore B001 after adding the subhood and you're done. ...To follow the story, read EVERYTHING carefully. Start with the neighborhood storybook. It will introduce you to the characters and how the hood is structured - just click the storybook/album icon on the main map to get started! More bits of story are to be found in each family's photo-album, and in each character's biography (click for an example) We created six families for this neighborhood; with one family still in the family bin. There are also eight pre-made ghosts. 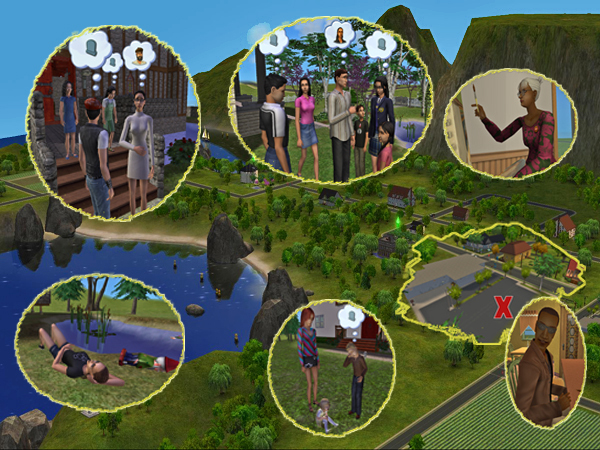 You can read more about the families and the individual sims in the comments of this thread. This town has been suddenly embroiled in mystery. Everything is chaos. Is there a murderer on the loose? 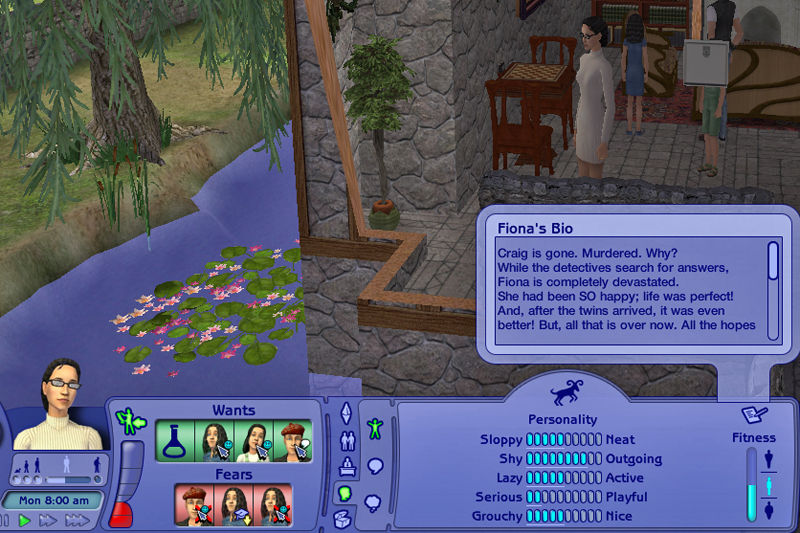 Maybe one of the eight deceased sims knows what happened? You can resurrect one and see if their biography is helpful or not. 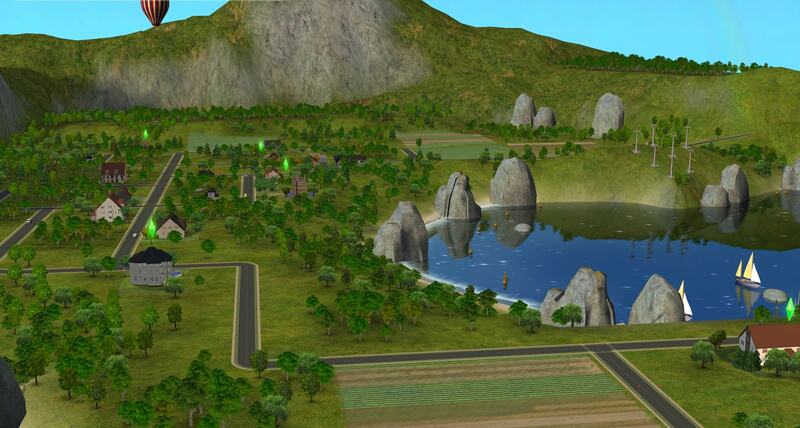 To resurect the sims, you'll need University, FreeTime or the Apartment Life expansion pack. If you do not have those EPs, then you'll have to wait until the ghosts appear at night. Use "boolprop testingcheatsenabled true" to make the ghosts temporarily selectable in order to read their biographies. Don't forget to make them unselectable before the ghosts leave the lot. Of course, you don't have to follow the neighborhood story. You can play as you want. Help the detective find the murderer, or help the criminal kill as many sims as possible - the choice is yours. 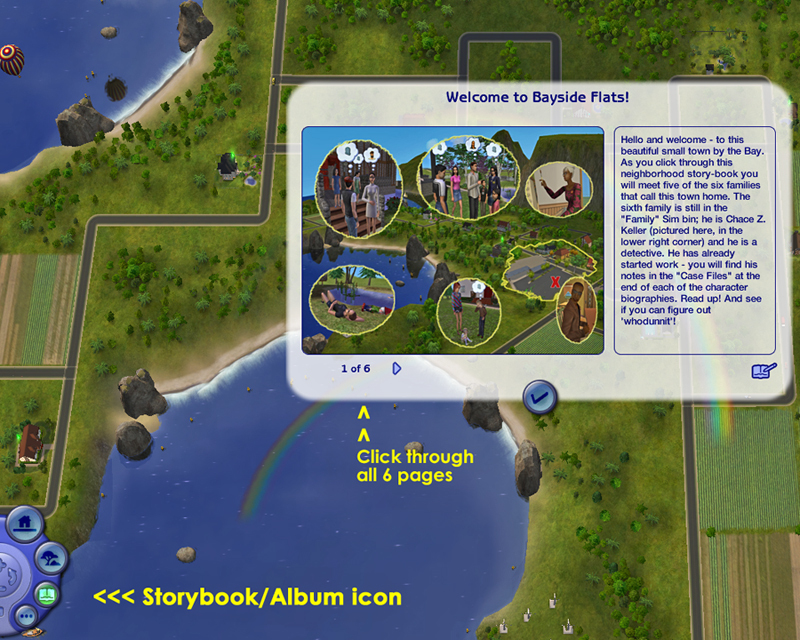 Bayside Flats uses an edited SC4 terrain of EA's Mesa Flats map. You don't need to install a camera mod for this neighborhood. You will see all of the lots in a vanilla game. In some cases, you may have to rotate the camera a bit in order to load certain lots. This neighborhood has been created with Numenor's AnyGameStarter with no Maxis content, so there aren't any townies or any NPC. You have to generate them yourself if you want them. We have built a cemetary lot for this neighborhood so you can move your urnstones to the cemetary. You need Nightlife for this. If you don't have Nightlife but later EPs. 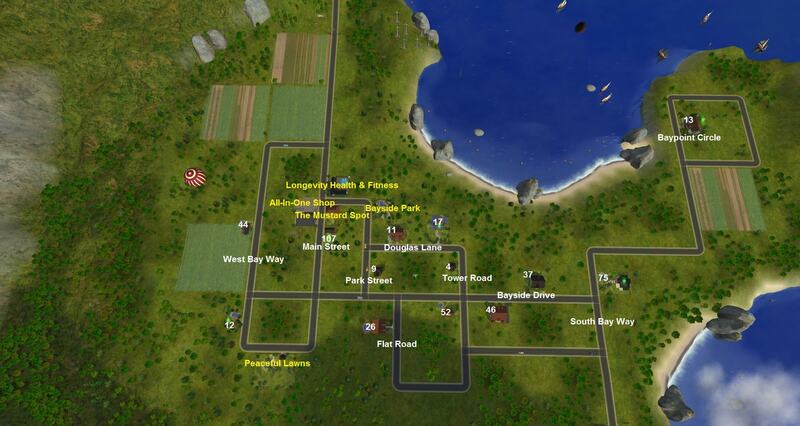 Then you can put the urnstone into the inventory of any sim and visit the cemetary lot with that sim. Then you can click on the ground and choose the option to place the tombstone. You can read more about that cemetary lot (Peaceful Lawns) in the comments of this thread. There are 8 vacant lots in Bayside Flats. Bayside Flats is base game compatible and doesn't have any CC in it. The shopping district/suburb subhood requires TS2 OFB and the downtown subhood requires TS2 NL. This is our 3rd neighborhood and we'll soon start working on the 4th neighborhood. We always accept applications. So, if you want to join us, you can PM us and we'll add you to the group. Stay tuned for more neighborhoods to come! Peni Griffin for proofreading the descriptions. 305 people have said thanks to Hood Building Group for this download.